Carlin and Evan have nailed down a wedding date! 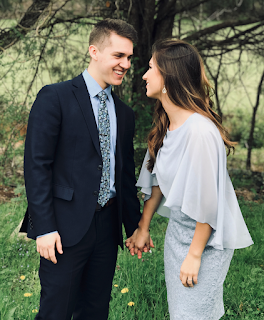 The two will become husband and wife on May 25th, 2019, which also happens to be one day after Alyssa and John Webster's five-year anniversary. So far, all six of the Bates couples have been engaged between three and four months before getting married. 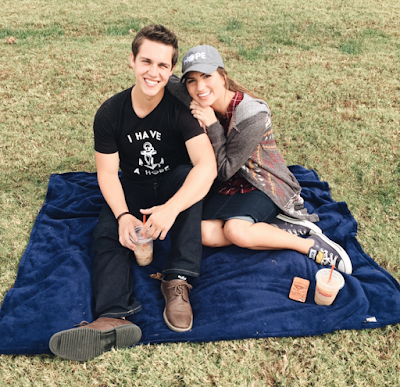 When Carlin and Evan tie the knot, they will have been engaged for eight months. They started courting in August 2017 after meeting at a women's conference at Evan's church one year earlier. A Spring wedding will be beautiful! Best wishes to Carlin and Evan!! I'm glad Carlin and Evan took it more slow than some of the others. I can't wait for them to get married!! They are such a cute couple! May is a wonderful time to get married! Maybe to give Carlin more time to mature. 3:30, your comment wasn’t very mature. Even if you feel that way you could practice a little restraint and decorum. She has matured much more in the last two years, and will continue to do so just like any other young adult. Some people just get there sooner than others. I agree 3:30. I think that was also stated on the show or in an interview. Perhaps his parents encouraged him to have a more "normal" engagement period. At least what most people have, although I am not exactly sure why. Probably so the could finish the school year, it’s not that complicated to guess. I think the reasons why many people have long engagements are: 1. Venue-lots of venues have a year long waiting list. From a practical perspective, where I live, engagements are usually 6+ months because venues book up months if not a year or more in advance. Also, many wedding dress companies take months to fulfill orders. The Bates and Duggars seem to have better access to dresses given their "celebrity" status and relationships with certain retailers. Carlin and Evan will have beautiful lush backdrops for photos with a May wedding. Engagement is such an exciting time. Wishing them many years of happiness together. Congratulations and looking forward to seeing your wedding. Enjoy this very special time. Congratluations - enjoy this very special time with your families as you prepare to be husband and wife, looking forward to seeing the photos. Congrats Evan & Carlin. It's been a long time I made a comment on the blog..
Hope you're doing ok Neddy. I love that Evan and Carlin broke the normal timing and did their own thing. If I remember correctly Alyssa and John were married on Papa Bill and Mama Jane wedding date. Congrats to the upcoming Stewarts. I am so happy for them and I am excited to see what carlins dress will look like. God bless their union. Awww... Yay, Carlin and Evan! Congrats! I be they are so excited! Can't wait to see Carlin's style for the wedding! I've bet it will be gorgeous like her! This couple seems to have allowed a longer period of time for each steps of their relationship. I wonder if they plan to be married for a while before they have a baby? Tori and Bobby had similar timelines between meeting and official courtship and between courting and engagement. The reason they pushed their wedding up was due to Bobby's job. That's a nice time for a wedding. Congratulations on your up coming wedding,Evan and Carlin. Congratulations to the sweet couple. Very glad you found each other and took your time nurturing your life path together. What do Evan and Carlin do for a living? Evan is going to school for an electrician; however, it seems he's already working. Perhaps that is when both will be finished with school. I personally think it is more mature of them than some people gave them credit for. Hope they are happy. So excited for them! If I could've picked a month to be born in, I would've picked May! Looking forward too the new season .Blessing .To all.